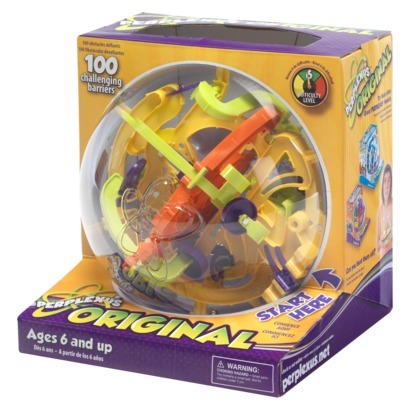 "Challenge your mind and improve your hand-eye coordination with the PlaSmart Perplexus maze puzzle game. You must work with gravity to move a marble through the maze by twisting, flipping and moving the sphere while avoiding barriers. •Manufacturer's Suggested Age: 6 Years and Up"
What we thought: Warning! This maze is addictive! But so much fun for both adults and kids:) We have really had a good time trying to master the Perplexus. It really encourages hand-eye coordination and problem solving. This colorful 3D maze is a great quiet time activity for the kiddos that they really love. Perplexus would make a great gift for the child or adult who is a fan of puzzles and mazes and likes a challenge:) ABCD Diaries gives the Perplexus maze an A+! entered Hot Tooling with Enjoy Hair Products Review and Giveaway.